Mehbooba Mufti had resigned as the Jammu and Kashmir Chief Minister in June after the BJP pulled out of the alliance. Former Chief Minister of Jammu and Kashmir Mehbooba Mufti, launched a scathing attack on BJP, its former ally, on Friday (July 13). She has warned that attempts to break the People's Democratic Party (PDP) would lead to serious consequences. 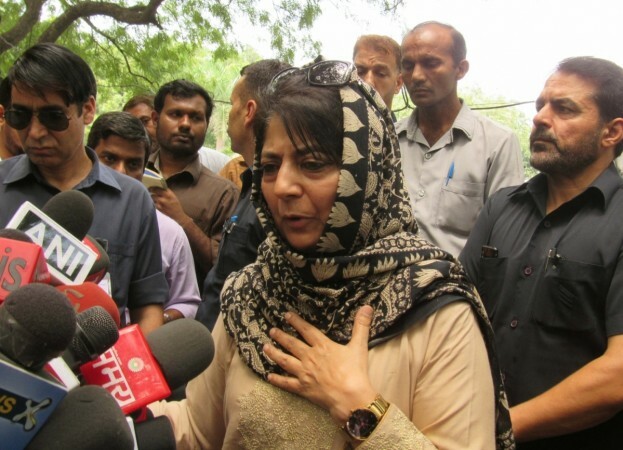 Mufti had resigned from her post in June after BJP pulled out of the alliance following the escalation of militancy in Kashmir during the Ramadan ceasefire. The state is now under governor's rule. She even warned the Amit Shah-led party that trying to break PDP or interfering in Jammu and Kashmir will give birth to more separatist leaders. "If Delhi, tries to dismiss the voting rights of people like 1987, if it tries to create divisions and interfere like that then I think just like a Salahuddin and a Yasin Malik were born in 1987...if it tries to break PDP like that then outcomes will be dangerous, Mufti said, according to an ANI report. 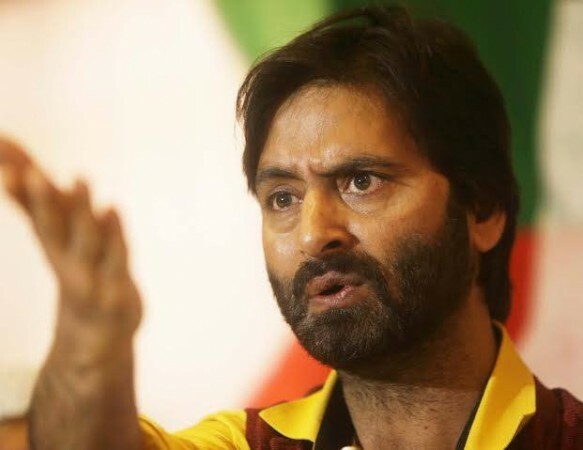 Born in 1966, Yasin Malik, is a Kashmiri separatist leader who advocates the separation of Kashmir from both India and Pakistan.He is the Chairman of Jammu Kashmir Liberation Front, which originally spearheaded armed militancy in the Kashmir Valley. He was involved in the kidnapping Rubiya Sayeed, the daughter of Indian Home Minister Mufti Mohammad Sayeed and targeting attacks on the government and security officials. Malik is also held responsible for creating an atmosphere of anti-Indian sentiment among public. 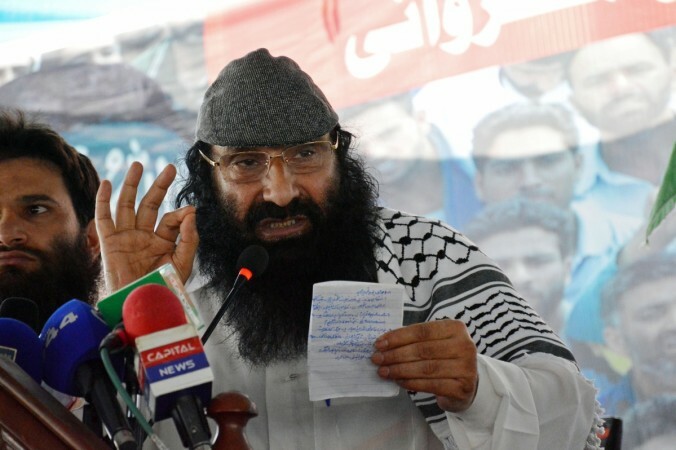 Syed Mohammed Yusuf Shah, who is popularly known as Syed Salahuddin is the head of Hizb-ul-Mujahideen a Kashmiri separatist militant organization. The 72-year-old militant is also the leader of an alliance called United Jihad Council, which was formed by the Pakistani Army to unify and focus efforts of various armed militant groups fighting against the Indian rule in Kashmir. The US Department Of State has branded as a Specially Designated Global Terrorist. Mufti was referring to the year 1987, as the elections that year was reportedly rigged, which in turned helped Farooq Abdullah become the chief minister of the state. The year saw the birth of insurgency in the valley and the exodus of lakhs of Kashmiri Pandits. 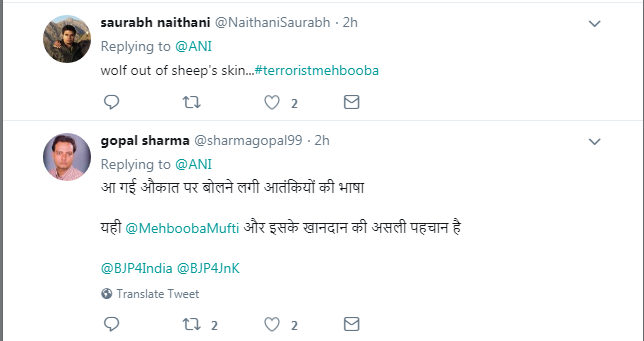 Naturally, her reference to militants like Malik and Salahuddin and terrorism-like situations in the state has not gone down well with many. 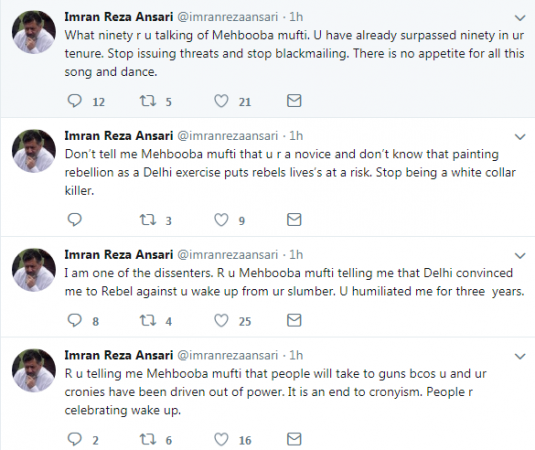 The former Kashmir CM, who is already facing rebellion from a few of her own party MLAs, is being lambasted by a disgruntled lawmaker. Former CM Omar Abdullah has also condemned her for talking about the revival of terrorism in Kashmir. 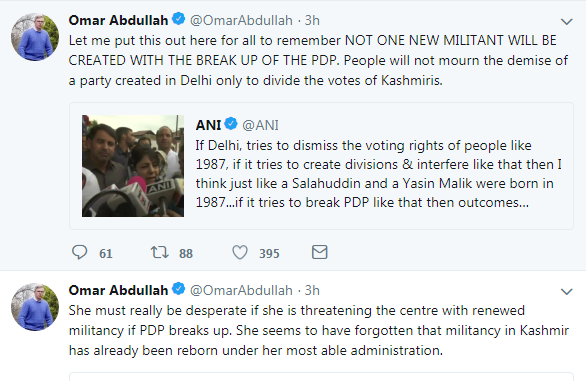 Former CM Omar Abdullah lashes out at Mufti.Omar Abdullah Twitter handle. Meanwhile, reports have claimed that a new government may be soon formed with either Mufti's party joining hands with Congress or the rebel MLAs working out an alliance with BJP with Sajjad Gani Lone as the facilitator.